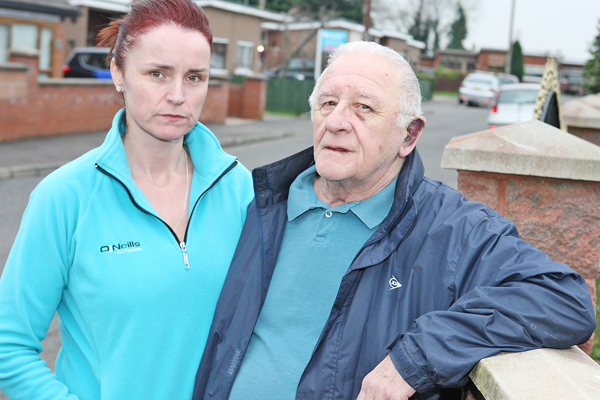 A 72-YEAR-OLD cancer survivor has spoken of his shock after he was dragged from his car and subjected to a vicious and unprovoked attack just yards from his Blacks Road home. Charlie Hill was driving to a doctor’s appointment around 2pm on Wednesday past when the assault happened. The retired bus driver who has lived in Arlingon Park for 45 years is well known for his charity work including raising £46,000 for a colonoscopy machine for the Royal Victoria Hospital. He said he now fears the attacker could strike again. “I was driving down and saw a man walking down the right side road looking massive, a big angry face. I only noticed as there was no-one else around. I saw dad’s car and a crowd around dad who was just lying on the ground. A blonde girl said he’s been attacked, she said ‘That fella just hit him’ but he was gone. The attacker was on drugs or something because why else would you do that, let alone in broad daylight? People said they seen the man approach the car, but my dad knows everyone so they thought nothing of it. Basically he just opened the door and that was it, dad didn’t stand a chance, he just full-on attacked him. Charlie and his family are now hoping CCTV will lead to the attacker being identified. Police are appealing for information and said investigations are still ongoing. The man is described at 5’7, average build, wearing a monkey hat, dark bomber jacket and blue trousers. He may also have bruises as a result of the attack. Anyone with information can contact officers in Woodbourne police station on 101, quoting reference number 1052 of 18/01/17. Or if someone would prefer to provide information without giving their details, they can contact the independent charity Crimestoppers and speak to them anonymously on 0800 555 111.